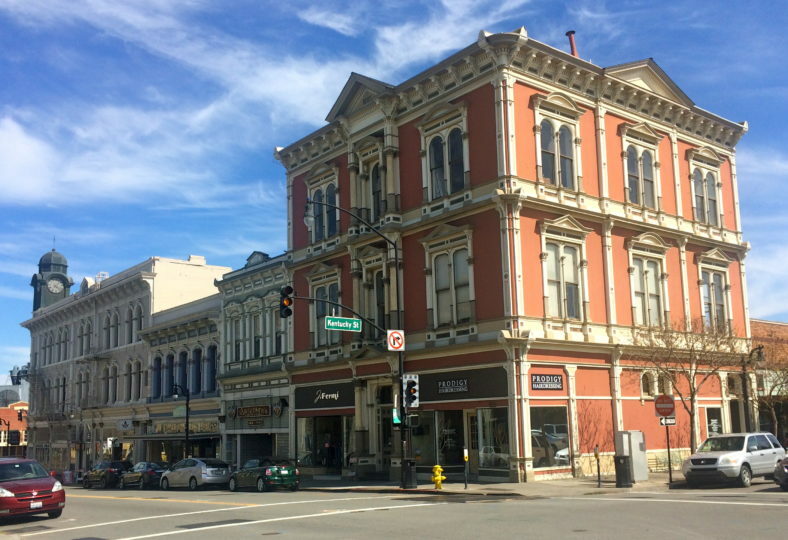 Once called the Egg Capital of the World, the attractive Sonoma County city of Petaluma greeted our members in June. We gathered at the former Carnegie Library that now is home to the Petaluma Historical Museum and Library. Local historian Katherine Rinehart provided a background talk on the area’s history, while we enjoyed coffee and pastries. There followed a tour of the downtown, which has a noteworthy collection of cast-iron front buildings. We headed then to D Street, where Paul Heavenridge and Paula Freund greeted us at their home; we took a break for box lunches in their beautiful garden. Homes we viewed along the D Street corridor are among the finest in Petaluma and represent the work of such architects as Albert Farr, Julia Morgan, Warren Perry, as well as prolific local architect Brainerd Jones. Christine Balch, the owner of an 1893 Queen Anne residence, welcomed us with a pause for cool drinks in the shade and gave us a tour of the interior, undergoing a careful restoration. A particular pleasure was St. John’s Episcopal Church by noted San Francisco architect Ernest Coxhead (1890). The congregation generously allowed us entry and provided an informed description of ongoing restoration work. Chapter members and Petaluma residents Todd and Janet Gracyk organized this day’s program for us.